Seventy-three years ago today, the first Social Security checks went out to beneficiaries. The anniversary comes at a difficult time for the program. It narrowly escaped a cut floated by the Obama administration in the fiscal cliff negotiations that would have reduced cost-of-living increases going forward. While it’s not in danger anytime soon, it does have a 75-year funding shortfall, one which has even advocates like Nobel laureate economist Peter Diamond calling for its finances to be shored up. So the National Academy of Social Insurance hired the marketing firm Matthew Greenwald & Associates to conduct a survey of a random sample of Americans to see how they’d like to see that shortfall closed. 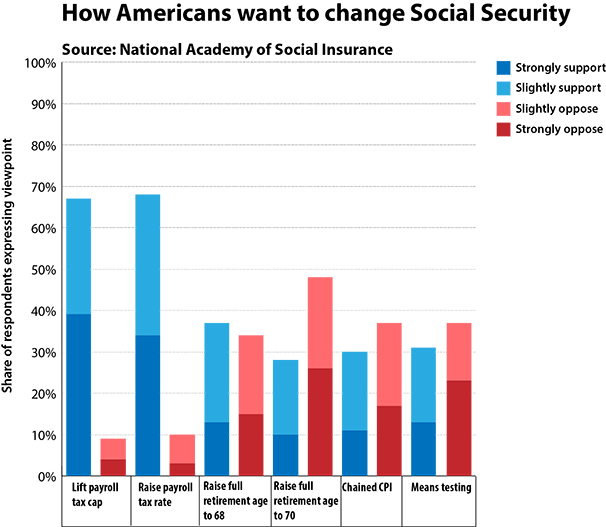 The survey used a technique called “trade-off analysis” to see which elements of a potential deal made respondents more or less likely to support it. So if a package with spending cuts and tax increases gets a certain amount of support, and a package with just tax increases gets another amount, you can then analyze those results to figure out the response to spending cut proposals. The survey also explained policies before asking for respondents’ opinions, to avoid getting responses that were basically arbitrary. The survey found that most major benefit cuts — including chained CPI, means testing and raising the full retirement age to 70 — strongly decreased respondents’ likelihood of supporting a deal. By contrast, revenue-raisers, such as increasing the payroll tax rate oreliminating the cap, elicited strong support and made respondents significantly more likely to support a deal. More mild measures, like raising the payroll tax cap to include 90 percent of wages, and raising the retirement age to 68, elicited mild support. The only benefit changes that people really liked were benefit increases. The following chart shows what the raw numbers looked like. It’s always dangerous to put too much faith in public opinion surveys that ask about specific policy questions, even ones like this that preface those questions with explanations of the policy being considered. People will say a lot of things if you just call them up and ask them. What’s more, it’s hard to get policies passed even with the support of the vast majority of the country when monied interests oppose them. As Martin Gilens has documented in his book Affluence and Influence, politicians act on the preferences of low- and middle-income people only very rarely, especially when their views are opposed to those of upper-income people. “Let’s raise taxes considerably on people making over $110,000″ — which is what raising the cap on Social Security amounts to — seems to fall in that camp. But the survey does serve as a useful indication of the public’s feelings on how best to solve the long-term funding gap. 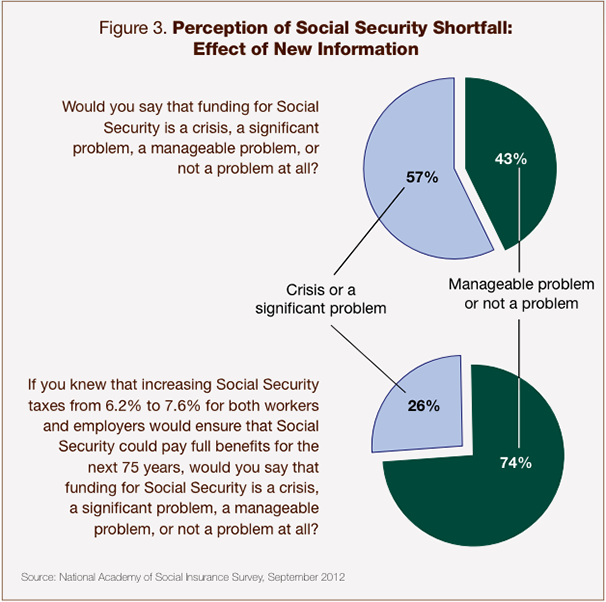 One more thing — the study also asked people if they think Social Security is in crisis. Given politicians’ and journalists’ fear-mongering on the subject, it’s not too shocking that 57 percent said yes. Then the survey conductors told respondents how much taxes would have to go up to close the gap. That dropped the number to 74 percent, as the following chart shows. That’s an important reminder of just how elite-driven peoples’ views on topics like this are.